In the first two decades of the 20th century in the United States, the national mood changed radically from one of heady optimism to dissolution. The new century began with the conviction that progress was on the march, and America was in the vanguard of democratic forces. Progressivism permeated politics and culture, and, particularly among the young intellectuals, it seemed that the “Promise of American Life” was nearing fulfillment. Such feelings and beliefs were no doubt naïve, but clearly the previous century had been one of progress socially, technologically, and culturally. There seemed no reason to think this would not continue. For a significant group of young radicals, it was an exciting age in which social and political democracy seemed destined to continue to grow, and in which they would play a significant and formative role. By the end of the second decade of the new century, nearly all of this was left in ashes. What Thomas Jefferson had termed the “Last Best Hope of Mankind” had collapsed under the weight of war. Idealism was dead, progressivism had been driven to the margins, and the young intellectuals were left to survey the wreckage. Looking back from the mid-thirties, Willa Cather wrote that the world had broken in two in 1922 or thereabouts. Certainly that could be said about American culture in the wake of World War I, and among the breakage were the ideas and energies of five young radicals who are the principle subjects of this fascinating study: Randolph Bourne, Walter Lippmann, John Reed, Max Eastman, and Alice Paul. Each of these lives reveals an important strain of thought in the first decades of the new century. Each of them saw their mission as continuing to push further reform to fulfill the ideals of American democracy. With the exception of Alice Paul, the lives of these radicals touched one another directly. Some were friends who became ex-friends. All five saw themselves as patriots committed to American progress albeit in a variety of different forms. Jeremy McCarter uses a chronological approach, moving from the opening of the century through the early 1920s. Each of the radicals moves in and out of the narrative, and there is a sense of zeal, optimism, and dogged determination surrounding them all. McCarter also has a feel for the Bohemian life led by Eastman and Reed, as well as for the community feeling of Greenwich Village. When Woodrow Wilson was elected president in what appeared to be a major triumph for progressive politics, there was a growing sense of hope despite some misgivings about the character of the Presbyterian elder. All of the young radicals had some acquaintance with, and access to, the president. When the war came, first without American participation, and then in 1918 when the United States joined the Allied cause, the divisions grew. The tale of how each of these radicals were impacted and transformed by the war is powerful and very well told by McCarter. Alice Paul’s struggle for women’s suffrage as leader of the National Woman’s Party may be the most compelling of all. The street protests, the White House picketing, the attacks on suffragettes by angry mobs, the vicious treatment by jailers, the hunger strikes, and the confrontations with President Wilson are riveting. The full power of the state used to crush democracy in the name of patriotism is fully exposed in this vivid section of McCarter’s narrative. The other radical, whose story is perhaps least known and yet the most important is that of Randolph Bourne. He was an intellectual whose powerful and precise essays have been lost to standard American histories. Bourne understood and warned of the dangers that war posed to democracy. For his efforts, Bourne was pushed to the margins of even radical society and then was crushed by both friends and the power of the state. Physically Randolph Bourne had a misshapen body the repelled many who did not know the person inside that body. By the time of his death in December of 1918, his spirit had been twisted into a kind of reflection of his body. McCarter’s portrait of Bourne is perhaps the most important aspect of the book, but, as with all writing about Bourne, there seems to be a need for more. After the war was over and progressives surveyed the wreckage it was clear that only Bourne understood what the full consequences would be, and how it would crush the idealism of youth. McCarter also argues that the relevance of Randolph Bourne for our time is his belief that the concept of Josiah Royce’s “Beloved Community” might be applied in the United States. Bourne saw the unique quality of America as its trans-national character, its blending of all those national traditions brought to the United States by those seeking a new world. As such in the world at war the United States, he believed, must remain aloof from Europe and its rabid nationalism. The lives of Max Eastman, John Reed, and Walter Lippmann individually and collectively reveal the currents and cross currents of this period in history. These are idealists, opportunists, adventurers, journalists, and men of influence in leftish intellectual circles. At times that influence, especially in the case of Lippmann, spills over into the mainstreams of the power centers of America. 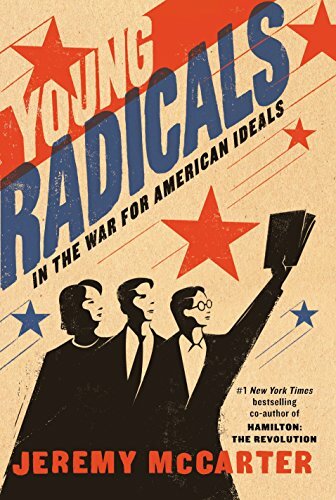 McCarter does an excellent job of conveying the complexity and excitement of the times and placing these young radicals into this central era in American and, indeed, world history. World War I did much to shape the course of the 20th century, and McCarter’s energetic portrait helps to make the case that this was the most significant two decades in the history of the United States, and these young radicals were among the most significant participants.